It's amazing to me how much homeschooling has refined me as a person and as a mother. God has laid it on my heart to work on PATIENCE this year. He has impressed upon me the importance of RELATIONSHIP and SLOWING DOWN. During a week where a lot of things went haywire (ill parents, broken appliances, pre-teen attitudes, etc...), I drew on strength I wasn't quite aware I possessed. Homeschooling means your children are privy to all that goes in your life. There is no "when the kids go to school" so you can deal with the messiness of life. My kids are right there dealing with all of it with me, and this week I witnessed that this is a beautiful thing. People talk about homeschoolers being "sheltered" and not ready for the "real world", and I just couldn't disagree more. I knew this week was going to be interesting. My dad had surgery over the weekend and had a rough time with recovery. My mom is battling breast cancer at the same time. Let's just say this homeschooling mom's mind was preoccupied this week. When I offered to go right away and help, my mom said to me, "No. You have an important job homeschooling your children and taking care of your husband. I will let you know if I really need you." While I wish I could have been there, I appreciate that my mom is still taking care of me - just like she has done for the past 42 years. There aren't any words to describe how that feels and I do not take it for granted. Thanks for your continued prayers for my sweet mom and dad. Let's get on with Collage Friday! We enjoyed a wonderful day at Callaway Gardens with friends. I haven't been as intentional about field trips this year - not sure why this is, but the year isn't over yet and I would like to change that! The boys enjoyed biking around the trails at Callaway, and Anna and a friend enjoyed chatting while they walked. We made a visit to the butterfly house and also took in a great birds of prey show. It was a great chance for me to practice using my new camera (well, if you remember I got a new camera just before I went to Ecuador in December) - that picture of the owl was snapped from the BACK of the birds of prey show. My little PowerShot has a great zoom. Being in Classical Coversations Foundations program has been a huge blessing for my son. This program fits him like a glove, and he adores going each Tuesday to be with his friends. It also inspires him to learn all he can when he goes home. I really can say that he is self-motivated nearly 100% of the time. Another thing I just love about CC is the way everything just flows - from the scientists, artists, and musicians... the connections made throughout the program amaze me. If you are in CC you know what I'm talking about. * Milk art was done while the kids learned about Degas. This was a simple art project that all of the children enjoyed. I have been eyeing the book CC uses for this - Discovering Great Artists. Lo and behold, Grant and I went to GoodWill after our community meeting and I found the book there for $.50! Score. 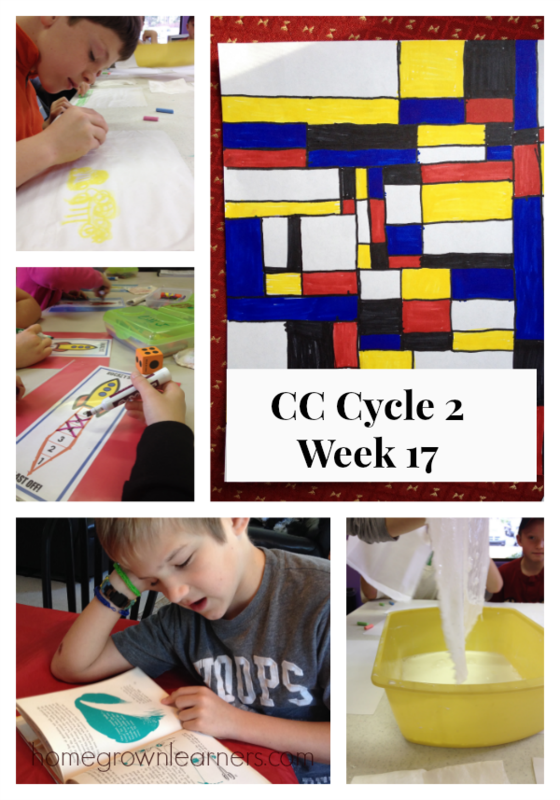 * Grant did his weekly presentation about Piet Mondrian. I had talked to him once about an artist that used only primary colors and squares and rectangles intersected by black lines. Out of the blue this week Grant asked me if we could learn about that artist and could he make works like his? It turned out to be such a great teachable moment because Mondrain was living during the time of WWI - which is right where we are in history. Grant's been using his Sharpies to draw several Mondrian inspired pictures. I love it! *FYI: Sharpies are still on sale through Amazon. We use them for map tracing, art projects, making colored schedules for the week, and so much more. *Grant was very interested in Isaac Newton this week because of a book I had picked up at a used booksale. My friend Jimmie, of Jimmie's Collage, has a cute Three Laws of Motion window book printable on her site, which Grant made this week. He also watched a funny LEGO movie about the 3 Laws of Motion. 1. We are thankful for a middle school boy at church that is handing down copious amounts of LEGOS to Grant. Grant has been in HEAVEN! 2. Next week on the blog I will be reviewing Zeezok Publishing's music appreciation curriculum. While we use SQUILT as our main music appreciation curriculum, I have long admired Zeezok's composer biographies and have loved the chance to use this in depth curriculum with the kids! 3. Mocha Latte - in the Keurig. I have sworn off Starbucks (too expensive) but still love a latte. This was the perfect solution - for less than 1/2 the price. 4. I've been making a simple concotion that everyone loves. 1 cup dark chocolate almond milk, 4 sliced strawberries, 3 ice cubes. Blend and enjoy. Yum! 5. Sometimes I am struck by how quickly Anna is growing and what a beautiful young lady she is becoming. I snapped this shot of her while she was eating an early dinner before going to youth group with a friend. I tried a new recipe -- Slow Cooker Chicken Taco Chili. Two thumbs up from Anna! It was really good! 6. Baseball practice resumed this week. My little boy LOVES baseball. 7. My dryer died this week. Not to go into a long story, but PLEASE get your dryer vents cleaned once a year. I'm so thankful we didn't have a fire. I'm NOT thankful we have the longest dryer vent in history. I am thankful for a dear man who came out clean the vent for me (who also happens to be a homeschool dad). The SQUILT Music Appreciation curriculum is on sale for 30% off until Monday. Use code WINTER at checkout! I am in the process of finishing the latest volume, and I will be at the Great Homeschool Convention in just a few weeks with the curriculum on display. This is a HUGE step for me - one that is involving major amounts of time and courage. The series about homeschooling "big kids" continued this week with a post about fostering independence in your middle schooler. I've created a new page here on the blog specifically for middle school homeschool. Take a peek!